The Moorland Hall, Wheddon Cross, Somerset. 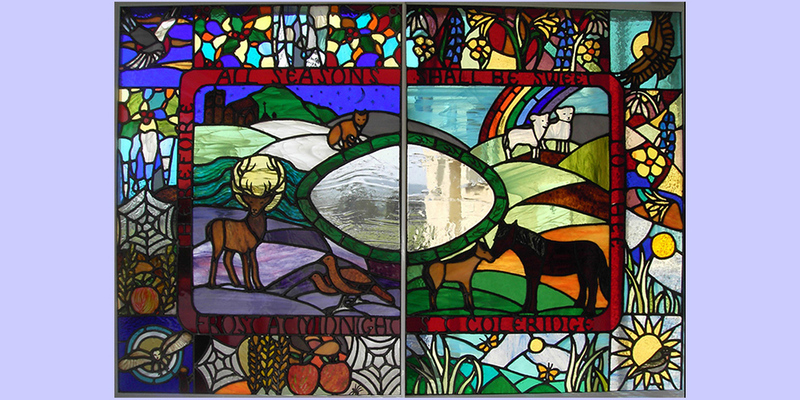 The Moorland Hall is on The Coleridge Way and his beautiful poem Frost at Midnight served as the inspiration for this interpretation of the Four Seasons on Exmoor. Nearly thirty local people of all ages learned the basics of working with stained glass. They all made light catchers, then collaborated on the design and making of the two large panels. This was part of the Creative Communities project, supported by Artlife.